Description: Show proficiency in capturing high quality images and editing them. Then, taking the image and incorporating it into a color poster/flyer with a matching color scheme. Process (Programs, Tools, Skills): I started the project by choosing a color scheme I wanted to work with. I used my Visual FOCUS book and selected a split complementary. As I was deciding on my subject, I looked around my environment for examples. I noticed that a stool I had used a split complementary scheme and I had the idea to create a Halloween poster using a decorative pumpkin I had in my house. I composed the image and captured it using my Nikon D90 to capture an original raw, .nef, image. I opened this file in Adobe Photoshop and made several editing adjustments, including: levels, sharpness, saturation, and color balance. Then I saved the work as a .psd file. From here I created an 8.5 x 11 layout. I started working with different fonts and and design elements. I created the color scheme first by using the eye dropper tool and pulling colors from the stool and adjusting them to what I wanted. I made the title in three separate pieces. I changed the glyphs into shapes and used the Pen tool to connect the p’s and the l’s so they align perfectly. I also made a selection and deleted the background of the image. Then I drew the vine on the pumpkin and created shapes, for the eyes and nose of the pumpkin, from using a selection from a copy of the image. I edited the shapes by changing their hue/saturation. I decided to include a quote about October to add my body copy and elements to my poster. 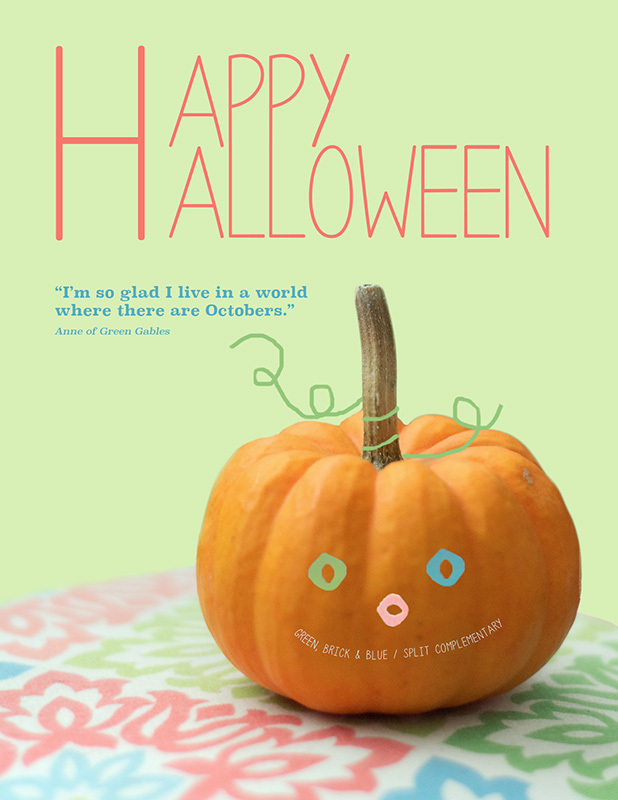 Message: I wanted to create an inviting fall/Halloween poster that has a playful and happy feeling. I also wanted to include my color scheme to show my personal grasp of the color wheel. Audience: The audience is for people who appreciate fall and Halloween and are interested in a fresh perspective that differs from the traditional orange and black color scheme. Top Thing Learned: I learned how to better manipulate text and create shapes using Adobe Photoshop. Color scheme and color names: Brick / Split Complementary. The supporting or complementary colors are teal and green. 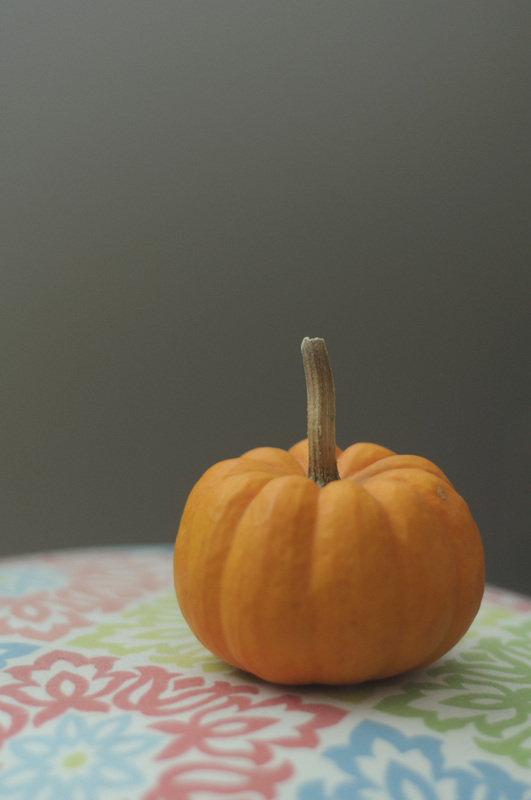 Thumbnail of original, unedited image taken October 14th in my home. You did a fantastic job with you photo-design this week. I really like the way that you edited your image. You also did a wonderful job changing the background behind your pumpkin. The way that you incorporated your swatches into the face of the jack’o’lantern was so creative! Wonderful job! Great job on your design. I love the way you made the whole design the photo and then brought in the design elements on your pumpkin. It is amazing how different the two pictures are from each other. You did a great job and bringing out the stunning hidden colours. Here is a link to a classmates blog: http://dannilarson.wordpress.com/ They did a design with a the light pastel colours as well.